If you feel like your Mechanics 2 lessons are going in circles, or you don’t think you’ve got the potential to get work done, this post may be helpful to you. Remember, with great power comes great energy transfer per second. Centres of mass naturally follows on from moments, and even if the class won’t be studying volumes of revolution any time soon, it can’t hurt to throw a bit of quick calculus their way here, even if it’s just the hand-wavy kind. For instance, the centre of mass of a triangular lamina lies on each median line (from each corner to the midpoint of the opposite line). 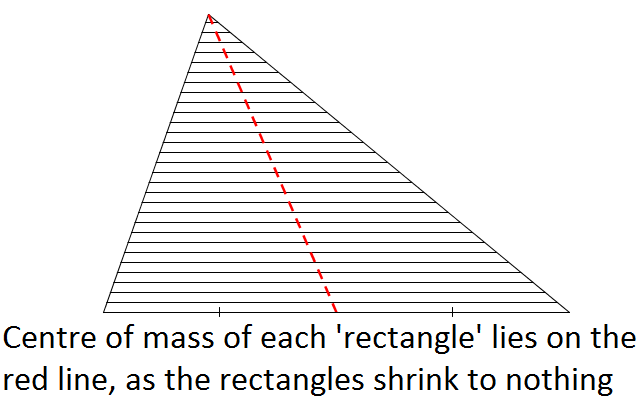 Imagine cutting the triangle into many small rectangles. The centre of mass of each is on the median, therefore so will their combined centre of mass. I brought in a small cardboard box with a rock duct-taped to one end of the inside, and we threw it around a bit to get a feel for non-uniform objects. Remember, the centre of mass of any object can be found experimentally by suspending it from a point, balancing it on a point or even spinning it as you throw it (what this last one lacks in accuracy it makes up for in student engagement). My next example is usually a roller-coaster drawn on the board, with loop-the-loops, strange twists and turns, and definitely not constant acceleration. By knowing the height at any point (and neglecting – for now – resistance forces) the speed can be calculated easily. This will be handy later, when applying energy to circular motion. Add in friction (keep it constant for now), and the only extra information you need is the length of the track. Energy is definitely one of those topics where I’ll need all colours of whiteboard pen available. I describe kinetic, gravitational potential and elastic potential in terms of bank accounts where we can save energy, or withdraw it. Any work done by, or against, external forces are like money being paid into the system from outside (or paid out from the system). We have no control over this energy, just like we don’t control money that isn’t ours. The difference between work done against, say, friction, and that done by weight is that we can cash in the energy we’ve ‘lost’ to work done against gravity by moving downwards to release it again. Just like money isn’t lost when I put it in an ISA in the same way that it is when I spend it in a shop. I like how it makes that middle section clearer: the brief time while the rope is being stretched but the force isn’t great enough to slow you down yet, only reduce your acceleration. There’s also an Excel version which will give you more precise figures, but doesn’t illustrate the concept quite so well, I think. If you enjoyed Top Gear’s Porsche versus Beetle race, you may like to throw this activity in there at the end. 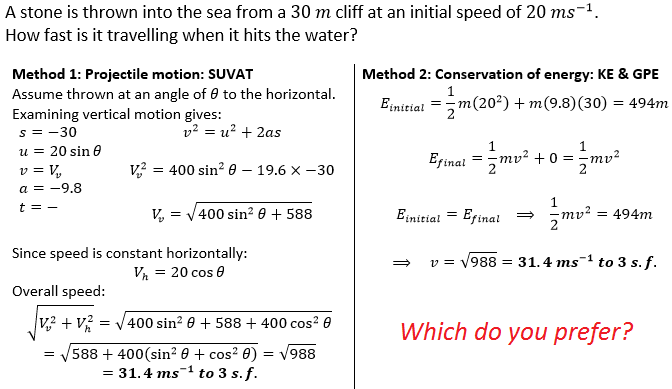 It starts with SUVAT, then improves on the model using energy, assuming a constant air resistance, and then goes further by taking into account variable air resistance (don’t worry – I did the tricky maths already, so there’s a nice-ish formula for students to use). Although the last bit isn’t necessary, it makes a good extension, as this is what more and more precise mathematical modelling looks like in reality. Circular motion is the next big thing. As always, start with the definitions and spend enough time messing around with them that the formulae are not only familiar but have practically been derived by students. I like to start by asking which is going around faster; the Earth around the Sun, or the Moon around the Earth? Students will, quite correctly, come up with two different answers, depending on their interpretation, and that’s the motivation for a definition of angular speed. Sticking with constant velocity for the moment (but that doesn’t have to be ‘horizontal circular motion’, remember), we can actually calculate the height of a geostationary orbit. That’s pretty cool, right? Use my GeoGebra illustration to show what happens to the forces as you go around the circle (but bear in mind the details in the previous document, as this demo is limited). The only other thing to get your head around is that pretty much every single question will involve forces and energy. Resolve towards the centre, because you know that will be equal to the centripetal force which we have a formula for. And use conservation of energy, combined with the height, to find the speed. The link here is the speed. The final chapters of M2 take us beyond SUVAT at last. The progression began back at GCSE (or earlier) with the constant speed equation, was developed further into the constant acceleration equations in M1, and now, in quick succession, using calculus to describe motion when acceleration is given as a function of time, then using differential equations to describe motion when acceleration is a function of displacement. This opens the doors wide on all sorts of problems, and even though many of them can only be solved using much more advanced techniques, being able to generate the formulae is half the battle in the days of WolframAlpha which will solve your differential equations for you. The nicest application of these topics, though, brings us right back to circular motion. It is useful for a teacher to be able to derive the formulae for centripetal acceleration for constant angular velocity. It’s worth being aware of the derivation for variable angular velocity also, but probably not worth the half-hour it would take to go through it in class! As with M1, I’ve made a Checklist; those key skills which are potential limiting factors for success in M2, but do not, on their own, constitute a full understanding of the module. The M2 Ideas Test, on the other hand, is often a considerable challenge even for A-grade students, and will really test how comprehensive and thorough a student’s understanding truly is. 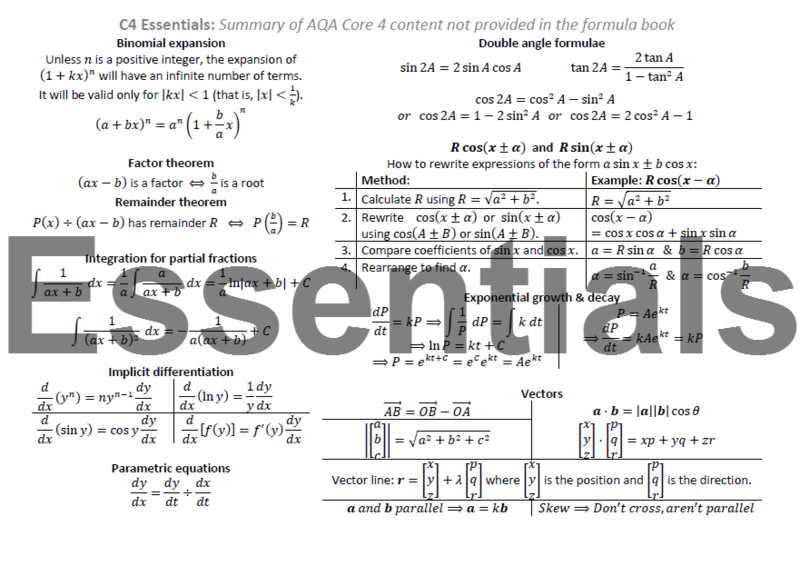 And, of course, the M2 Not-Formula Book and the one-page M2 Essentials revision card, both of which summarise key information from the course which will not be provided in the formula booklet, and are highly recommended for independent revision and reinforcement of ideas. I’d love to hear your thoughts on any of these resources, and of course any others you have found particularly useful. All through school I loved algebra for the power it gave me to describe patterns and solve problems. And I loved physics for the insight it gave me into how and why things work the way they do. A-level Maths & Mechanics was where they both came together for me. I can describe archery using algebra, use calculus to explain a car race, even drag trigonometry out of triangles and use it to play conkers. Below are a few ideas and resources I’ve put together over the years for Mechanics 1. Watch this space for a follow-up post on Mechanics 2. This relates directly to our exam board of AQA, but content is broadly similar across the exam boards. I like to kick off the year with this little translation activity. It’s a bit of fun, but it brings out some of the specialist vocabulary used throughout the course, and prompts discussion of assumptions and the mathematical modelling process in general. Chapter 1 is, on its own, not really examinable, but sets the scene for all of applied mathematics, so in my opinion is well worth a lesson. I refer back to the mathematical modelling cycle frequently in reference to verifying results, an appropriate level of precision for answers, considering the suitability of assumptions, and so on. Or use this Equations of Motion investigation with a class to have them generate them for themselves. On the subject of unit conversions, one of the most useful is the ratio of metres per second to miles per hour. Why not set this as an exercise for the class? From 5 miles is roughly 8 km it’s easy to see that 1 m/s is roughly 2 mph. I describe friction as a ‘reactive’ or ‘passive’ force. Much like the normal (contact) force, it will resist potential motion, or slow it down, but would never, on its own, cause motion. This idea can be extended in M2 for the contact force when we have circular motion (we must have a centripetal force, and only if there’s no other force providing it, the normal reaction steps up). I’ve made a simple dynamic illustration of a particle in equilibrium on a slope (and, if you hadn’t spotted it yet, did you know that the minimum coefficient of friction for a particle on an inclined plane is just tan of the angle to the horizontal?) Friction is the best excuse to tip desks up and watch books slide off. At 45 degrees? Coefficient of friction must be 1. It’s worth asking conceptual questions about the friction formula, too. Why are formula 1 cars designed to have a massive down-draft pushing them into the road? What forces would change as a result? Statics is important, and resolving forces for a mechanics student is like taking a blood sample for a medic, or adding VAT for an accountant. It’s not the hardest thing you’ll ever do, but you’ll need it so often you’d better make sure you not only understand how it works but be able to do it in seconds without breaking your train of thought. Students will need to get past drawing right-angled triangles for every force so that they can focus not just on a method that works but the best method for this particular question. Sometimes that’s a vector triangle and cosine rule, sometimes it’s resolving horizontally and vertically and sometimes it’s picking a better pair of directions to resolve. Newton’s laws help us to describe how a bicycle can outpace a car – briefly – when the lights turn green, or how a child can tow a 10 tonne barge. One example I like is dropping something too heavy to hold; instead of just dropping it, let’s say you try to slow its fall. You can’t completely counteract the force of gravity, but you can reduce the overall downwards force, so that the object accelerates downwards less quickly and you may avoid a broken washing machine. Finally, I’m going to recommend my M1 Checklist (a list of all the basic skills that, if lacking, will cause problems), the M1 Ideas Test (great for ironing out misconceptions and going beyond ‘can solve problems’ to ‘understands the concepts’), and my M1 Not-Formula Book and the one-page M1 Essentials revision card, both of which summarise key information from the course which will not be provided in the formula booklet, and are highly recommended for independent revision and reinforcement of ideas. You can always tell which topics I enjoy teaching by the number of resources I create for it. Density is definitely one of my favourites to teach, to any age group, possibly because it links in so nicely with ‘real world science’. I can include apple bobbing in lessons, melt snowballs on the radiator, and discuss why a 12,000-tonne iron ship doesn’t sink. 4. Tell a story: The classic Archimedes Eureka story may, it turns out, be a bit of an oversimplification due to the tiny tolerances involved (but don’t worry: Wikipedia gives a suggestion of some even cooler maths involving buoyancy that is probably closer to the truth, and can form extension work), but the story is useful nonetheless, and could easily be turned into a Eureka activity. 5. Talk about gold: For some reason we love to think about expensive things. The value of gold per gram, coupled with its high density, make it very valuable in small amounts. A pencil made of gold would cost you upwards of £300. Have them measure an eraser and work out how much it would be worth in solid gold. A 6-inch diameter sphere is worth £1 million. And if you want to go really big, consider All the Gold in the World. 6. Conduct devastating thought experiments: Not content with melting all the gold in the world into a big lump (which, by the way, would be a cube barely 20m to a side), let’s Melt the Eiffel Tower. This one is crazy: due to the highly efficient wrought-iron lattice structure, it’s incredibly light for its size. And since it also has quite a wide base, if you melted it down to form a cuboid with the same square footprint the height would be a mere 2 inches. 7300 tonnes may seem a lot, but if you scaled it down perfectly to fit in a classroom it would weigh around 3kg (the same as a large laptop). The metalwork this model requires would be ludicrously thin (think 3 layers of tinfoil). 7. And what’s the atmosphere like at this point in the lesson? Denser than you thought? At 1.225 kg per cubic metre it may well be. Remember a cubic metre of water weighs a tonne, though, for comparison. Students may be surprised to calculate that the air in their classroom weighs as much as them. Bring it back to the Eiffel Tower and compare the weight of the iron (7300 tonnes) to the weight of the air within (modelled as a pyramid I get the air to weigh 2000 tonnes). Not the same, as some websites would have you believe (and blithely tell your class for years before doing the maths yourself…) but pretty close! 8. Shoe-horn density into other topics: When you’re doing volume of cylinders, have students work out the weight of a dug-out canoe. Combine volume of a pyramid with the volume, and density, of The Great Pyramid (answers on a PowerPoint). 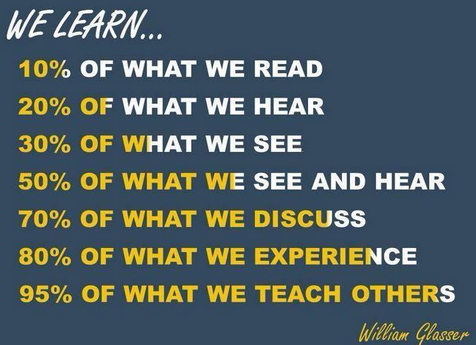 And finally – enough about what I’ve taught, how about what I learnt? While estimating the weights of mobile phones by holding one in each hand my class kept thinking the lighter one was heavier. Turns out, our brains were tricking us into comparing density rather than weight! An iphone was smaller than a Samsung, but denser. Still weighed about the same, but I’d have sworn it felt heavier. Try it yourself – your brain is automatically adjusting for volume! Hold them in bags so you can’t tell the size, and suddenly you can compare weights accurately again! The Samsung Galaxy Ace weighs almost exactly the same (in fact, slightly more), but because its density is 25% lower, it feels lighter!